Take your offshore tuna trolling spread to the next level with 6 pre rigged Tuna Slayer lures in all of the hottest colors including Black/Red, Blue, Green/Yellow, Purple, Pink, and Pearl White and rigged with 6 feet of 130lb monofilament leader material and a 7/0 Mustad stainless steel hook. 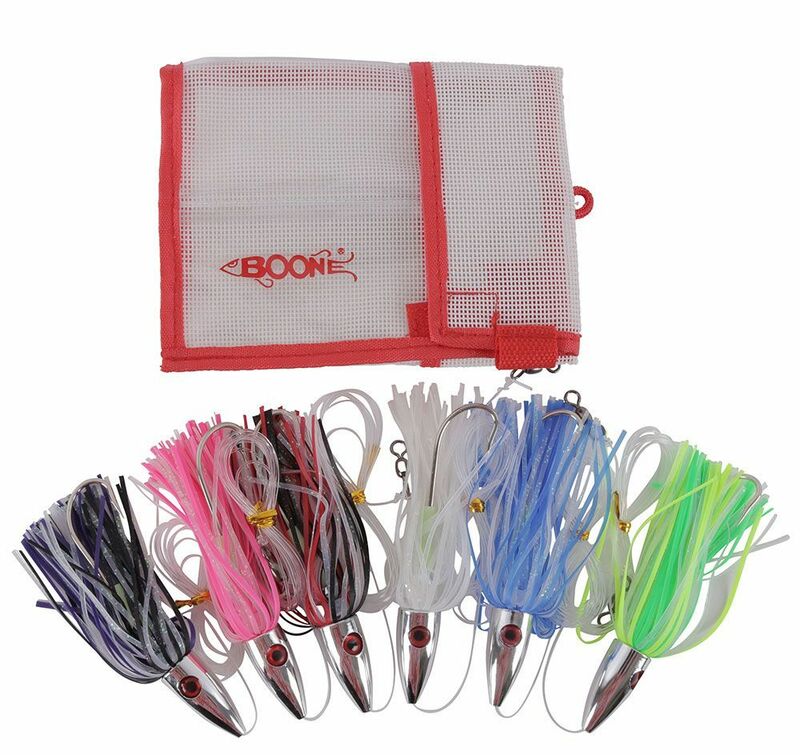 The Boone Tuna Slayer Kit will help take your offshore tuna trolling spread to the next level. Featuring 6 pre rigged Tuna Slayer lures in all of the hottest colors including Black/Red, Blue, Green/Yellow, Purple, Pink, and Pearl White and rigged with 6 feet of 130lb monofilament leader material, a 7/0 Mustad stainless steel hook, and a convenient lure pack to neatly organize your new tuna lures. Each Tuna Slayer possesses a highly polished head and a premium vinyl skirt that will hold up to vicious tuna strikes on the troll, trip after trip. Perfect to pull in any position of your spread, from off of your riggers to your flat line positions, these true tracking trolling lures give off an attractive and highly visible bubble trail that draws in all species of tuna and others such as mahi mahi and even small billfish from the depths. DonÂ’t get caught undergunned when the tuna bite gets hot, be sure to pick up the pre rigged Tuna Slayer Kit from Boone and slay the tuna on your next offshore trip. For the current price, this kit is definitely a must have. It's not the best but it gets the work done! Definitely not overly durable, but still very good for setting a quick and easy spread straight out of the bag. Great color variety, sure to draw a few bites anywhere. Shipped very fast. Great price on an essential trolling package. Lures swim straight and provide nice amount of smoke. Tackle Direct provides yet another super deal on something that all fisherman that troll for Tuna, Mahi and other pelagic fish might encounter. ProsGreat price. Great colors. Well made. Nice mesh bag included. Not terrible for the price but pretty cheap. Haven't had a chance to use them yet, but look well built. A little light, but should do the trick for black-fin tuna! Looking forward to setting these out in the spread. 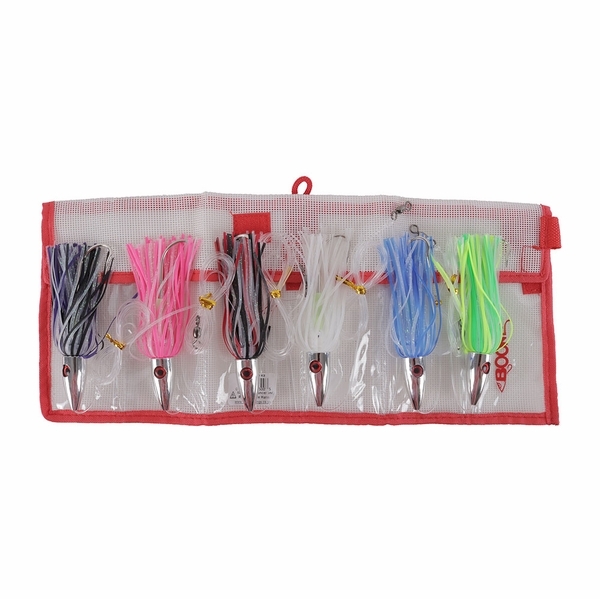 Good Quality Fishing Kits. Have used these in the past and have experienced excellent results. Can't wait to put these to good use come Tuna season. Again, Tackle Direct offers a good value on a quality product. I will be sure to put these to the test for Dorado and Tune in the coming months. This is a kit and storage solution combined pre rigged and ready to fish. 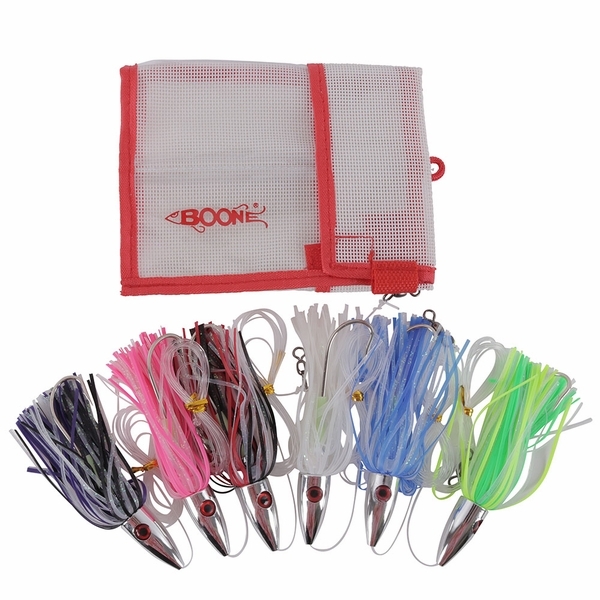 Boone put together a set of popular go to colors, pre rigged leaders and hooks. ProsMulti color selection ready in an organized kit. ConsI did not buy two of them. Nicely packaged, but I have not had a chance to use this item yet. Have not had a chance to use these lites yet. Hope to try them in the Florida Keys in the next couple of months. Lures run true and draw in strikes. This kit offers a great opportunity to get in the tuna trolling game at a price that I could afford. Having them pre rigged and in the bag is also very convenient. what is the overall lenght of the lure? Are the hooks the mustad 7691? What size skirts are these? What is the weight of each jig? 0.8 oz's but these are meant to be trolled not jigged.